We organize panoramic excursion above Sardinia with customizable itineraries on a plane to 4 people (3 partecipants + a pilot) and much more! You will observe Sardinia from ... "an HIGH" point of view! Discover Sardinia from an “high” point of view! 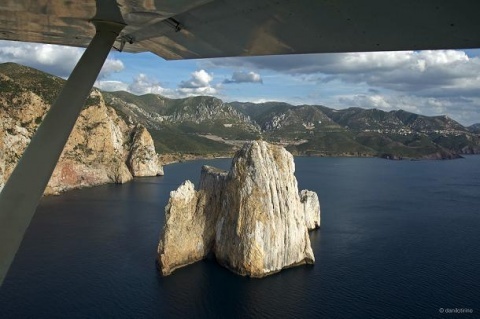 On board of our panoramic aircraft, we will lead you to admire actractive places of Sardinia from a privileged point of view. You can observe the most naturalistic landcapes as the stack of Pan di Zucchero, the sand dunes of Piscinas, the Gorge of Gorroppu and the beautiful beach of Cala Luna, or we can flight over archaeological sites as the Phoenician Punic and Roman ancient city of Nora, the castle of Acquafredda or the nuragic megalithic monument of Barumini. These are just some of our standard scenic routes. At your request, we can satisfy your curiosity with customized itineraries. The airfield is located near Decimoputzu village, just 30 minutes from Cagliari harbour. Eventually we can arrange a personalized pick-up service for your convenience.